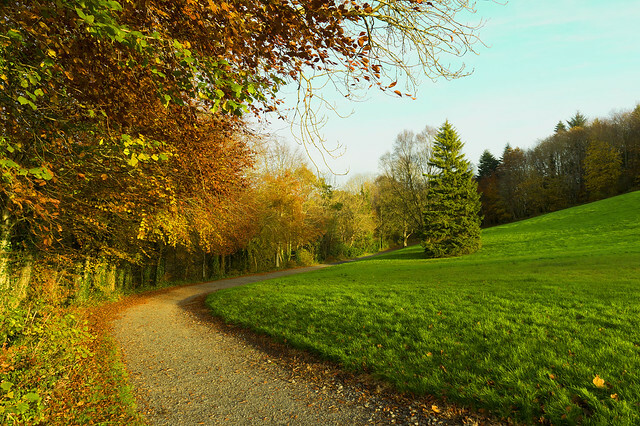 The 565 acre Dún na Rí Forest Park is located 1.5km north of Kingscourt on the R179 to Carrickmacross. It has an about 700m long paved, wheelchair suitable loop path with about 12m elevation difference (please check map and elevation profile below) and many other tracks. Some of them are not accessible due to some high slopes and steps. The main track (pictured on the photo above) leading to a lake and a big meadow (great for picnics) is made from a quite hard gravel so it’s also accessible. There is a car park with disabled bays and even wheelchair friendly toilet on the side.